When I saw the theme of this month´s Soap Challenge Club I knew for sure I wanted to participate. I really like this look and I didn´t have idea how to do it. So I was looking forward to learning this technique. I decided to try the Original Mantra Swirl. I like that you can see the surprise inside after cutting. 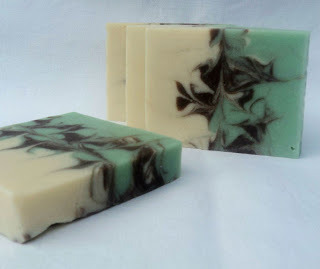 I scented the soap with an FO/EO blend - fresh, marine, airy Cool Sherbert, soft light Cucumber, with a little Vanilla Cream (non-discolouring FO) and just a pinch of Cinnamon. 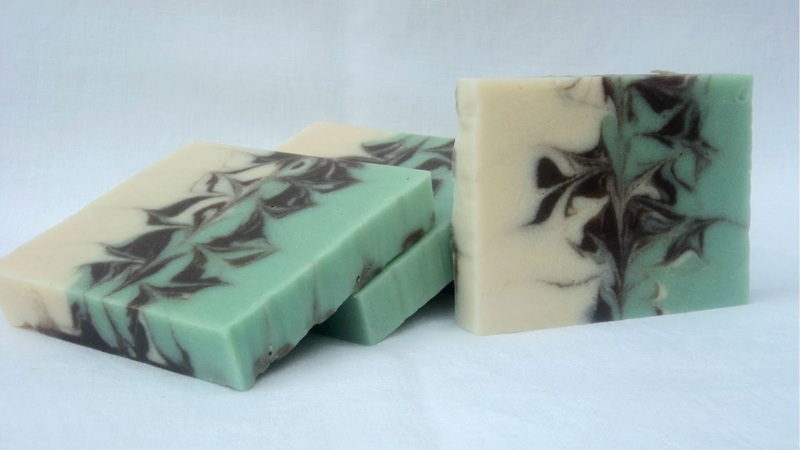 I coloured the soap with Ocean Green Mica, Cocoa Powder, Bright Mica, Black Oxide and TiO2. I used my favourite recipe for coloring and swirling (based on Lard, with Coconut Oil, Olive Oil, Shea Butter and Castor Oil),with White Clay and just a little yoghurt. Added my fragrance blend and after a while the batter started to thicken and got grainy. I tried to hurry up and luckily managed to do the swirl with some improvisation. What was the cause of acceleration? I think it was Cool Sherbert FO, maybe also well-known Cinnamon (but I used just a tiny bit), and it´s hot here, so even room temperature is quite high for soaping - at least for me, I am not used to it, because here in Central Europe we have such weather only around a month in the whole year. I imagine it must be pretty hard to make soap in warmer climate areas! In the morning the top looked good, no crackle, no separation. But many possible surprises might be hidden inside...When I cut the soap I was so happy! Every piece is different and the soap looks very close to my original idea. I am really pleased with the look and with the scent. 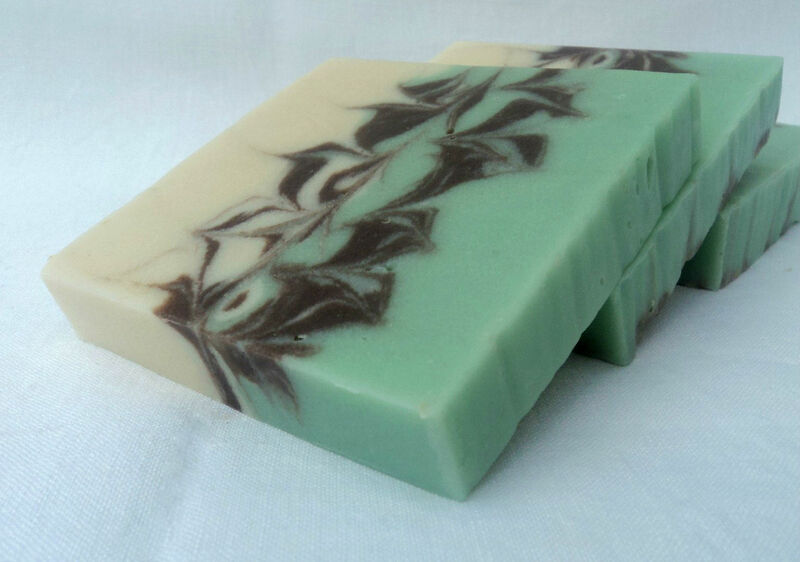 My husband says the soap is beautiful, it´s even his all time favourite so far. I am lucky and grateful he supports me in everything I do. I will certainly use this tehnique a lot, I like its variability. I am adding one photo of another Mantra Swirl I tried, it´s a soap named Indian Rose, scented with Patchouli, Sweet Orange, Lavender. 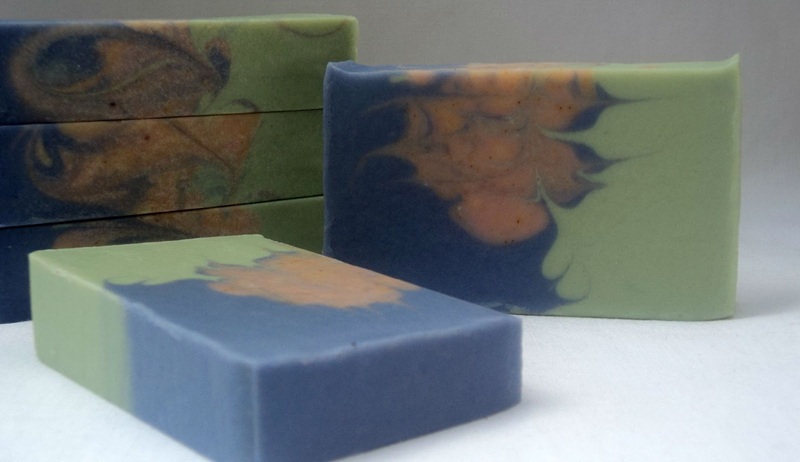 I´am looking forward to seeing all the other soaps, the link-up page full of colours is always wonderful. So gorgeous. I love love love your wispy swirl. I too like the idea of having the surprise when you cut this soap. Yours came out super nice!! I am so inspired to try this again after seeing your wispy swirl in the centre. I also love the sounds of both scents, and am going to try the Indian rose blend. Yes, go for it definitely, me too I will try it again! I think there are many possibilities. Regarding the Indian rose blend, I haven´t balanced it right. I didn´t want Patchouli to be too overpowering, used it at 20%, and I expected Orange to fade - but now I got mainly Orange scent, maybe it will evaluate with curing. Next time I would use 30-35% Patchouli. Both soaps are very beautiful, but the green-white-black one is just amazing! 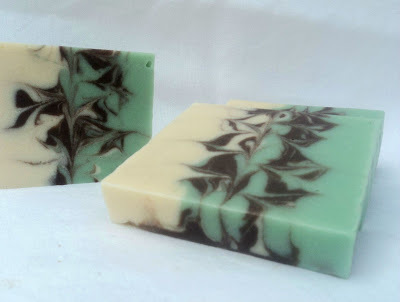 I love this soap, your swirl looks great! Wow, wow, wow, those are gorgeous! Congratulations! Very pretty. Love the swirl. Beautiful mantra swirl! The wispy black is divine. Thank you all for nice and encouraging comments! Excellent wispy swirls!! Great color choices too - really makes the black swirls pop! Very pretty...love that wispy swirl! I think your color choice is spot on and the swirl is beautiful. Check the site, you will be so thrilled. Congrats.